Representing a remarkable breakthrough in better performance and exceptional value. building and your reputation from the environment. This is the first and most important step in preventing mildew and mold. Providing a more comfortable and energy-efficient structure. 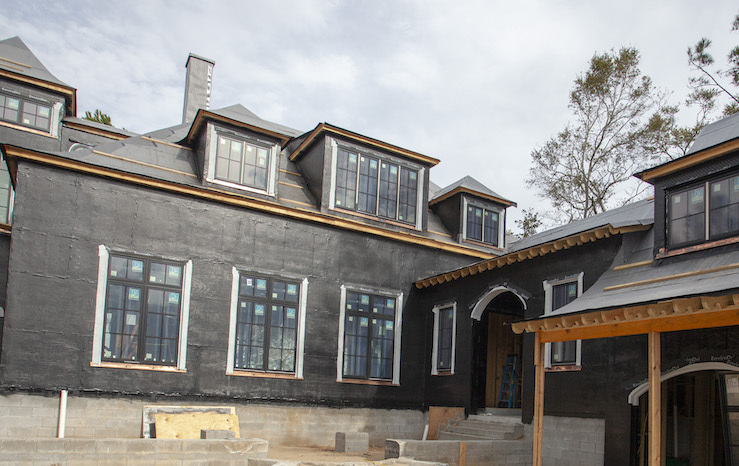 Our fluid applied membrane adheres directly to the sheathing system to prevent blow-offs in high winds. No need to worry about tears and rips caused by other sub-trades. Requires no mechanical fasteners that penetrate sheathing; stays in place as long as the sheathing is in place. No mechanical fasteners: Our fluid applied systems are installed directly to the sheathing system. There are no nails, no staples, no penetrations through which water can seep. Liquid moisture is stopped on the outside of the membrane. No seams: A continuous layer of protection, with no seams, flaps or gaps, means uninterrupted moisture and air leak protection for your home. Our fluid applied systems help keep your home drier, more comfortable and more energy-efficient. Unaffected by surfactants: Whether your home is brick, stone, stucco, wood or other siding, our fluid applied systems are not affected by the surfactants that can diminish the performance of wraps. Permanently attached: Our fluid applied systems remain in place, from installation during original construction, protecting your home or business from the elements for years. High winds won’t our rip our system from your home, unlike typical house wraps. In fact, rigorous code testing proves that our fluid applied systems can block water penetration in conditions representative of a 200 mile-per-hour wind-driven rain! Installed with nails or staples: By design, housewraps are installed using nails or staples. Each nail or staple hole through the housewrap (and on a typical home, there could be THOUSANDS of holes) creates a break in the system. And each hole in the wrap represents a potential failure of the basic intent of a wrap…to keep out liquid moisture. Once liquid moisture or air gets past the wrap, it is free to move behind the wrap, and find a path to the interior of your new home. Surfactants: Surface active contaminants are found in mortar, stucco, wood and cementitious siding, paint, soaps used to clean siding, and other sources. These surfactants interact with housewraps, and can significantly decrease the wrap’s ability to stop water from leaking through the wrap, even without holes. Not permanently attached: The fact that so many nails or staples are required to affix the wrap to the outside of your house is a clear indication that wraps are susceptible to tearing or blowing off. The more nails, the better it’s attached…and the more holes in the system. The more holes…the less effective the barrier. Vertical and horizontal seams: Every inch of seam that you see in any installed housewrap is a likely spot for air and moisture leaks. Often, you’ll see these seams covered up with tape. But tapes fail, too…and when tapes fail, so does the protection. The result? Energy-sapping unconditioned air leaks and moisture intrusion.